Wikileaks – Iraq War Logs – Channel 4 Dispatches, September 2010. Thank you for sharing such interesting & alarming info about the state of our world, especially since much of the media news we receive connects us to the threats derived in other countries. Until Obama’s residency, did we really fear diseases from Africa or millions of illegals suffocating public services, rewarded with benefits that our own population either doesn’t receive or must wait weeks & months for acquisition? My grandfather’s niece was one of the 1st assistants to Bill Donovan at the conception of the OSS & its transition into the CIA. She & her husband were artists, had a chateau in France, & did espionage jobs that went beyond any light press later reported in stories about their lives of intrigue, artistry & adventure. She did secretarial type duties at first & being a fearless, hands on participant engaged in any activity, she branched out in undertaking clandestine tasks. She continued to support Donovan after returning stateside. Had she considered to write a book about those earlier days, much of today’s speculations wouldn’t need to be mentioned. I hope you remain safe, well, and healthy. My name is Filippa Emilie Wolf Andersen, and I am one of three Danish students at Johannesskolen in Copenhagen. As a part of preparing for finals, we are currently doing a presentation on espionage during and after the Cold War, and the problematic aspects of the surveillance the secret agencies are doing as a part of the war on terrorism. 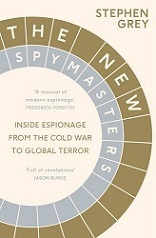 When I stumbled upon your book ‘The new Spymasters’ while on holiday in Budapest, it was a stroke of luck. I immediately purchased it, but only for my own sake; consumed by the book, I didn’t realize the relevance to our subject until I was a good way in. I then read the book faster than I care to admit – I like to pretend I have a life. To get to my point; I’ve used your book a great deal, both as a reference during the writing process, but also for inspiration, and I would be extremely happy if you would agree to an interview. Everything would be on your terms, the interview could either be a telephone conversation or over email – whatever you would like. While we would of course be thrilled if you said yes, I want to thank you either way – your book was not only an extremely enjoyable read – our project would be entirely different without it. It has certainly earned a place of honor on my bookshelf.